Our home energy audit saved us thousands! After some serious ice damming this winter, we figured we would be spending thousands on window replacements. So we had little to lose in having an energy audit performed on our home. Lawrence from Home Energy Detective arrived and performed a very thorough and professional audit of our home. And the results were a pleasant surprise! The source of the problem was a rather simple fix that we could do ourselves! In addition, Lawrence provided us with other simple do-it-yourself tips tailored to our audit results. It was worth the time and the money. Thank you Home Energy Detective! We hired Home Energy Detective initially to perform an energy audit on our house. Even though we had replaced both of gas furnaces and both A/C units within a period of 3 years, we still were not seeing much in the way of increased comfort or reduced costs due to the newer, more efficient models. Troy was able to identify a number of trouble spots, some of which we were aware of, some of which we were not. Troy uses state of the art equipment to give a very good picture where your home is leaking. 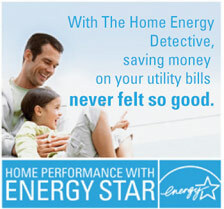 Not only does Home Energy Detective perform the audit, they will perform the work as well. We ended hiring the company to perform all of the recommendations. That being said, Troy does not do a hard sell. The energy audit stands by itself; he's not trying to push a bunch of products that are of questionable value. We had the attic foam sealed so that the temperature of the attic is within 3-10 degrees of the inside temperature. This is definitely the way to go. Our kids' rooms were always cold in the winter and hot in the summer; now they are quite comfortable. Another service we had done was sealing the duct work. I was a little skeptical about this, but decided to go ahead with it. I'm glad we did. There is a significant increase in the air output from all vents. Additionally, they found a problem where a duct was pouring hot air directly into the furnace room. We had talked to our regular HVAC contractor about this numerous times but they were never able to find the problem. Troy a pleasure to work with, presents his findings in a clear no nonsense manner, shows up when he says he going to show up (or calls ahead), and is an honest and reliable contractor. We are experiencing newfound comfort in our 30-year-old home! With the installation of recycled cellulose fiber blown-in insulation, foam sealant, and radiant barrier foil, our heat rarely comes on and when it does, it doesn't stay on for long. And thanks to you and your fantastic crew who installed tese envirnmentally-friendly products, we're already saving money on our electric bill. We used 473 fewer kWh in December 2009 (when compared with December 2008)! Another test of the tightness of our attic happened this year with the record snowfall we had. When the snow on our neighbors' roofs was quickly melting away, or roof still had a nice blanket of snow. Even a week later, our roof still had snow. We haven't been losing warm air out of our house through the attic. We are also enjoying the new attic stairs. It's nice to have well-functioning pull-down staircase that also looks great!